A Colorado Parks and Wildlife officer investigates the remains of a mountain goat shot dead on Quandary Peak, Wednesday July 4. 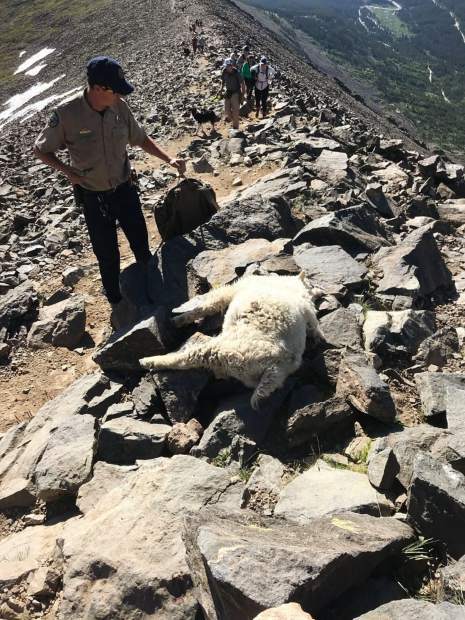 The investigation into the poaching of two mountain goats on Quandary Peak trail is still ongoing as Colorado Parks & Wildlife launches a criminal investigation and sifts through tips from the public. CPW reported Saturday that the two mountain goats had been shot on the trail at around 3:30 p.m. on July 3. The goats were found 40 feet apart, about a half mile from the Quandary Peak summit. The goats were shot with a pistol at point-blank range and their remains were left on the mountain. 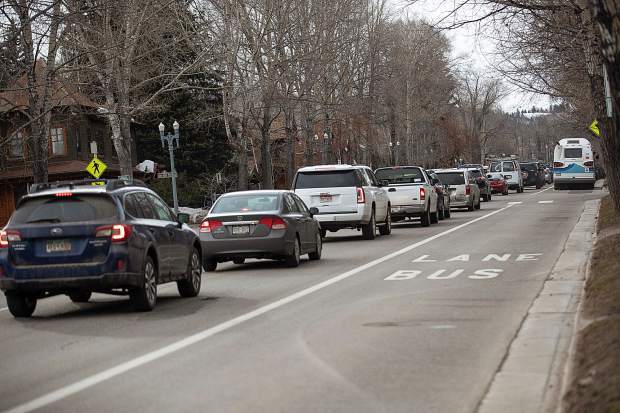 Quandary Peak is one of the most visited 14ers in the state, and CPW officials hope the increased holiday traffic means more opportunities for clues or leads about any suspicious or unusual activity. 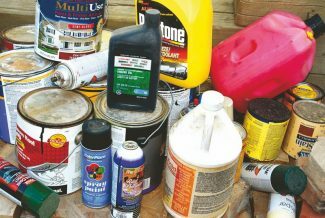 CPW urges anyone with any information to call in their tip to Operation Game Thief at 1-877-COLO-OGT or e-mail game.thief@state.co.us. There is a $1,000 reward for any information that leads to an arrest or citation. 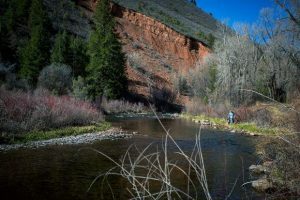 CPW spokesman Mike Porras said that while the agency received several tips from the public so far, they haven’t yet gotten the big break they’re looking for. Because the poaching is still under active investigation, the agency can’t provide any comment on what tips they’ve received. However, CPW works like any other law enforcement agency when investigating poaching cases. CPW regularly investigates poaching incidents around the state and devotes significant resources to finding the criminals responsible. Porras wanted to make clear that poaching is not at all the same as hunting. Until the investigation is complete, CPW won’t be able to release a full list of possible charges. However, CPW cited penalties listed under Colorado Revised Statute 33-6-109, “Wildlife – illegal possession,” in its press release. In that statute, the illegal taking, possessing or killing of a special animal like a mountain goat is a misdemeanor punishable by up to one year in jail, as well as a fine between $1,000 to $100,000 and suspension of hunting licenses. Porras said that other penalties might apply, including Samson’s Law for trophy animal poaching that slaps on an additional $10,000 fine per mountain goat. The two goats had become familiar to hikers, usually roaming around near the summit. The killings sparked outrage in the Summit community, with several members of the public pledging to add thousands in matches to the CPW reward. One gentleman personally came to the Summit Daily office and offered a $3,000 reward match for anyone who helps find the poacher. Porras said that CPW appreciates any help the public is offering and can’t stop them from offering bounties or rewards, but wants potential bounty-issuers to think carefully about the consequences of making that kind of promise, as well as the criteria for rewarding the money. For CPW’s part, the agency is offering the $1,000 to anyone whose tip directly helps lead to an arrest or citation, even if a conviction is not obtained. Instead of offering bounties or reward matches, CPW encourages that the public donate to Operation Game Thief, the agency’s program that rewards people who turn in poachers. 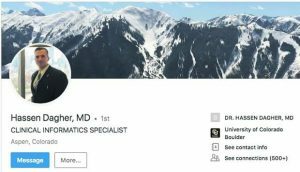 Checks payable to Operation Game Thief may be sent to OGT/Colorado Parks and Wildlife, Attn: Bob Thompson, 6060 Broadway, Denver, CO 80216. CPW also has a message for the killer or killers: Turn yourself in now and make it easier on yourself, while you have time.